A 10 min or so helicopter ride in after an hour delay due to windy conditions left us starting at the base of the ice climbing section of the Franz Joseph glacier. Looking at the majestic nature of the mountain around me - I had no idea that 6 hours later I would almost die on that very spot. When you stop to look at the view, you notice a few things. 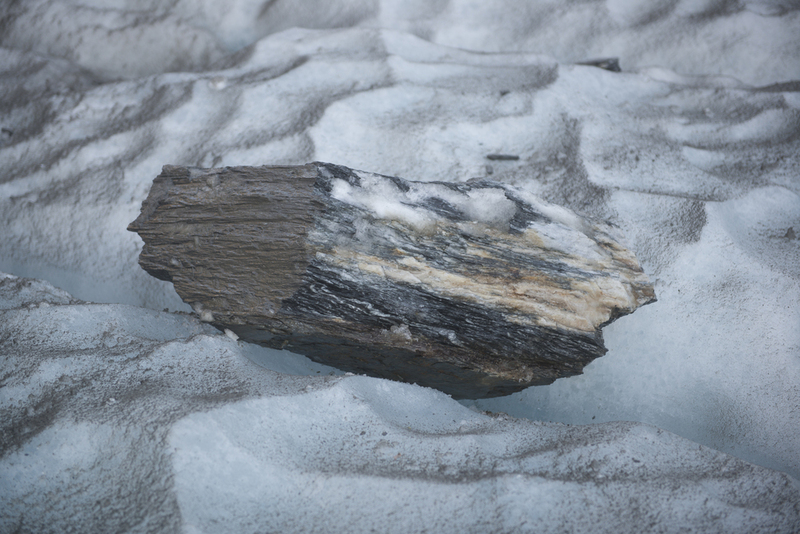 Firstly that the glacier has receded quite dramatically and secondly that the mountain is being slowly minced away under the enormous pressure of the shifting glacier - causing the rock faces to be increasingly unstable. 2014 has been a year of some dramatic disasters around the world - Ebola, Gaza and the Aviation to mention a few - and by no means do I place what happened to me among them. Saying that however, when something happens to you in first person - you will always be more effected by it. Firstly, quite humbly I’m grateful to be alive to write this journal. In fact writing this 24 hours later I still don’t quite understand or comprehend how I’m alive. Reviewing this months down the track I can’t help but see how dramatically it’s affected me, my outlook on life and my relationship with photography. As a human being I feel I’ve been through something quite rare and unexplainable - as a photographer I feel more than ever connected to the tapestry of space and time and the illusion of reality than ever before. .My first time wearing wearing crampons took some getting used too. Initially it’s quite unsettling walking uphill on ice, but after a bit of practise it became quite fun. Something that becomes immediately clear is that it's an environment with astounding beauty, but also one that you're biologically completely not designed for. Richard surveying the conditions for the first climb. The planned route was fairly straight forward - 4 climbs of increasing difficulty planned over 5 hours. Perfect conditions. Pristine shooting conditions. I made use of a circular polariser to bring back the details in the sky and compensate for the glistening ice. One of the fellow climbers learned the 'Y' formation technique. I actually found the climbing exhausting as it's quite methodical. If you break the rhythm you tend to tire quickly. By 4.00pm I had enjoyed an incredible 5 hour ice climbing experience on top of Franz Joseph Glacier in South Island New Zealand with my close friend and fellow photographer Jackson Gallagher, a british backpacker Krystal and Richard Bell our guide from Franz Joseph Glacier tours. I had just a few days beforehand received my new Leica S camera ( a $20k + investment in equipment ) - I was genuinely excited to have such an experience - to document it with an incredible camera. The overarching theme being the dramatic shift in climate having changed the glacier dramatically in the last 25 years was a privilege to photograph. The climb itself was fantastic. Professionally conducted in terms of skill, safety and pushing oneself on the ice. Richard - calm, patient and collected took us around and carefully explained everything whilst making learning about the glacier fun and factual. 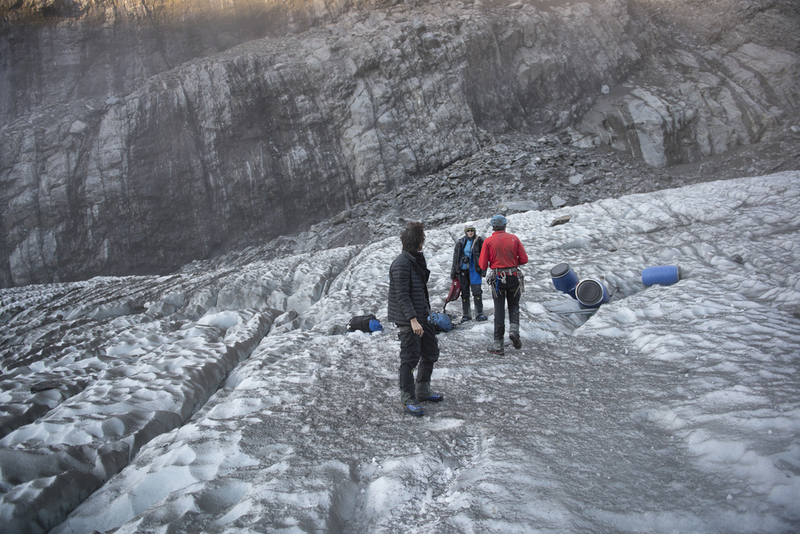 We made our way up 4 walls and finalised with a cave walk though near the top of the glacier. At the end of the tour whilst taking richard the guides portrait all three of us suggested to even come back the next day. Upon arriving at landing zone we took off crampons and helmets to pack them away before the helicopters arrival. This memory is both vague and acute and I will try describe it as best as possible. I successfully took off my crampons ( ice spikes to grip the ice ) and recall standing up. Not where you want to be standing.... The sense of scale is hard to fathom on the ice but that's around 250m directly above us bearing straight towards us. Immediately I turned back to our guide Richard who screamed ‘ RUN ‘ - I bolted around 20 degrees to my right on foot. I had both my Leica and a Nikon on me - I don’t completely understand why I separated from them I just lifted my knees and attempted to accelerate. I recall thinking that I was about to die as you can’t outrun an avalanche - not like in the movies. Although what I was seeing around me as the rocks started hurtling past me seemed like a very bad Michael Bay Film. At this point I started despite my best efforts not to slip as I was sprinting on ice - the sky went black with dirt and debris and I heard the sound of gravel being thrown on ice. Thuds made my chest beat like a drum all the while being as graceful as a duck on ice. Most of my superficial cuts were from this point as I was running, tripping, standing up then sliding over jagged ice. To my left a rock the size of a car flew past at over 100km p/h + - essentially in the 4+ metres that separated myself and Jackson, Krystal and richard. Along with thousands of small pieces ranging from tennis ball size to dinner tables - I kept sprinting as the sky got darker and the noise louder. I was able to run for around 5-10 seconds before thinking that at my height of 6ft3 I would have a large surface area that could be hit - as most of the rocks were flying over the first 3 metres above the the glacier after bouncing on the rock at the base of the cliff. 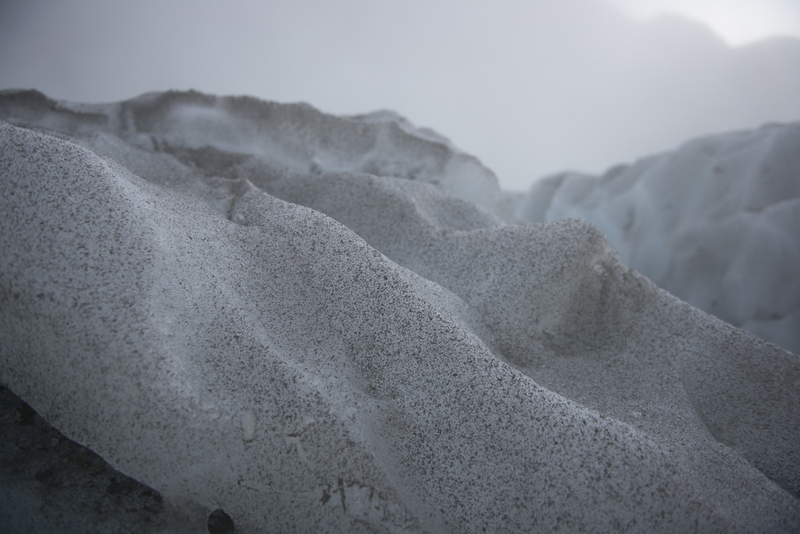 I saw a crevasse and jumped towards it - immediately fearing I would slip into the glacier as it was dark and sloped past what I could see. The Leica took the full force of me hitting ice as I jumped - the impact of the camera into my ribs was the first jolt of pain I felt and I was expecting so much more to come. The next 15 or so seconds in darkness and noise and rocks landing around me I can’t quite put into words. As I wasn’t moving, my back facing the cliff I was essentially just waiting to die. I lowered my head into a ball with my left leg wedged to into a groove to stop me falling deeper into the hole. I couldn’t see the others - Richad would later tell me he couldn’t believe I got so far and was screaming for me to get down - I don’t recall hearing him at all. Laying there thinking a rock was about to kill me, that I was helpless and not in control - that the odds were wholly against me - that everyone else was dead. After around 30 seconds the sky cleared and the noise stopped - I propped my head out and captured a wider view of what was in front of me. The scale of the rockfall now is daunting but at the time I didn’t understand what was happening very clearly. Thousands of shards, rocks and boulders. I then heard richard scream at me. I propped up further and turned to look back at the landing zone. richard, Krystal and Jackson were huddled together and once richard stood up I screamed that I needed help to get out of the crevasse. I sat there for 10 seconds in disbelief that we were all alive. As Richards radio had failed he violently signalling to another helicopter ( not ours ) overhead to clear away - as even small rocks can compromise the rotors dramatically. It was another tour group leaving another landing zone who had witnessed the event from the sky. He rushed over pulled me out and I instantly hugged him and grabbed his face screaming ‘ I have never going to forget your face ‘ - he sprinted back to others who had just started looking back at the cliff face. I ran up to Jackson - we hugged elated that we were somehow alive. Once I saw up close the size and nature of the rocks I started to shake as they were massive, razor edge and numerous. The quiet didn't last long as the second landing attempt started - without earplugs the noise was quite deafening. We started to make our way back to the helicopter clambering over the ice and staring in disbelief at all the debris around us. Suddenly my heart sank - the elation and disbelief of being alive suddenly and dramatically reversed as the pilot made an emergency take off and disappeared northwards - I looked behind us as the noise from the second avalanche started. The sudden change from noise of rotors to rockfall I can’t describe adequately. We then all ran to our right a few metres to the nearest gap in the ice - huddled together and said nothing. The dust came again, the noise and debris flying around us - again waiting to die. Huddled together the fear started really settling in - helplessness and flinching with every noise - almost worst knowing the size and scale of what was coming. Laying there as a ball I couldn’t help but think that I can’t do this to my mother - she barely made it through my younger brother Taylor passing away in May 2014. I couldn’t do this to her, I couldn't be so selfish as to die. After the longest 30 seconds the helicopter suddenly made a sudden landing and the noise again shifted back to deafening rotor blades. Richard immediately bolted and signalled us to go. Once we were in the helicopter I felt a sense of disbelief and let go and cried and shook until I could get my breath back. Covered in dust and mud and tears we started to fly back to back camp - I filmed the accent to capture the source of the rockfall. I looked over at Richard - the dirt here shows just what covered us. The next morning he would fly out to revisit the zone and he explained he were even luckier than he first imagined. It was the closest he has been to death in his career. It’s in a way me trying to deal with what happened - having the 4th wall as a story teller helps me digest the seriousness of the situation. 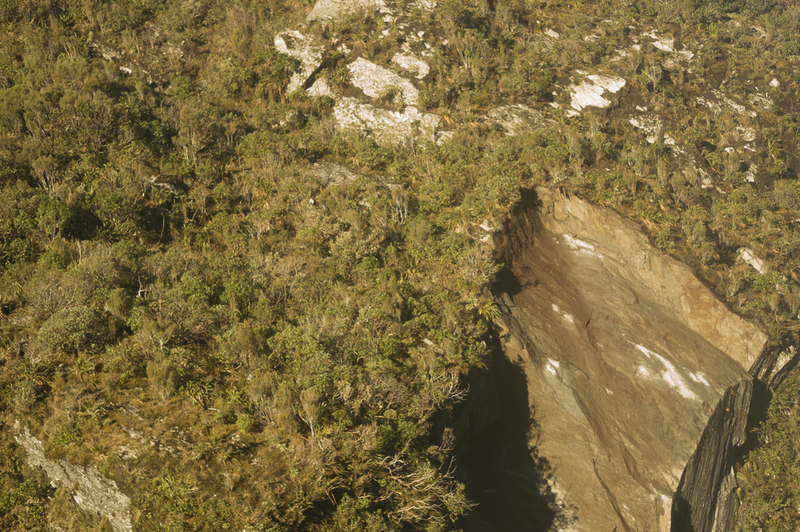 The main point here is I completely respect mother nature - its unpredictablity and the illusion of safety we all have in life - but more to gratitude to Richard the guide and Jamie the pilot for risking their own lives for mine. I am lucky I had the support of my friend Jackson - in a way we’re connected now by this experience more so than a usual friendship. There is a larger part to this story and the events afterwards are quite complex and ongoing. The entire glacier operation has been closed down on that section of the mountain. - and is testament to the seriousness of what happened. Upon investigation later on I discovered some gross negligence on the side of the tourism operator - essentially not paying for the geological studies to be performed to determine structural integrity of the rock face. Thank-you Richard and Jamie. Thank-you again and again. It seems frivolous compared to what we went through, but I was pleasantly surprised at the professionalism by Leica - as they offered me a replacement body the next day. I politely declined as I was a little too shaken to keep shooting.